After the miraculous feeding of the Five Thousand in John’s Gospel, Jesus proceeds with a long Eucharistic discourse on the Bread of Life, which reaches its climax in this morning’s passage. 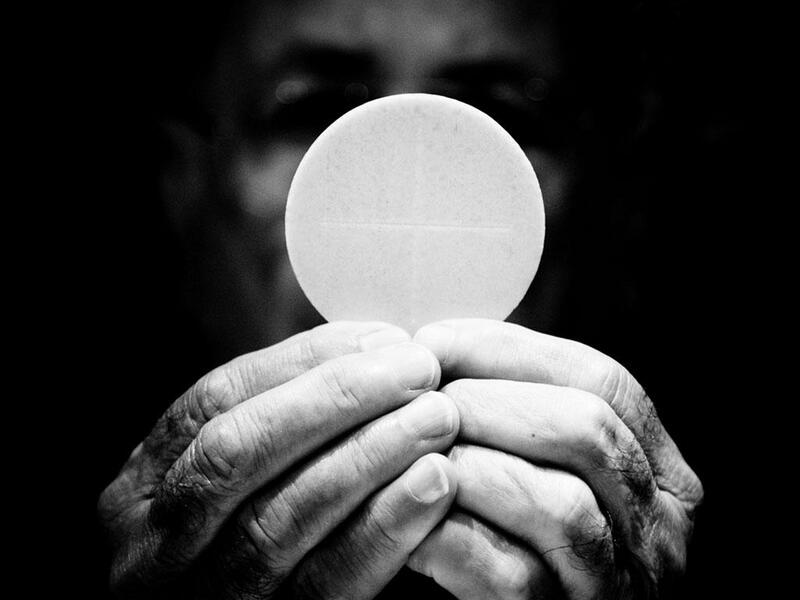 Those who eat the Body and Blood of Christ abide in Him and He in us: to abide, to remain, there is something comfortable and comforting about its permanence. We sing the hymn ‘Abide with me’ which expresses the hope that this might happen, the longing to be close to Christ. Christ gives himself to us so we may have life in this world and the next – it is a tremendous thing to say, and a troubling one. Jesus is speaking in the synagogue in Capernaum to Jews for whom the consumption of human flesh and blood is anathema – it is unacceptable, and unthinkable. What Jesus is promising goes against everything which they know and understand about their faith. He calls them to do the unthinkable. It is sad to think that even then ‘many of his disciples turned back and no longer went about with him.’ Jesus had said something difficult, something troubling, something which turned the accepted order on it its head. People were unable or unwilling to accept what Jesus asked of them, and so He turns to his disciples and asks them if they want to go away too. Peter the leader of the disciples is the first one to reply: ‘Lord to whom can we go? You have the words of eternal life. We have come to believe that you are the Holy One of God.’ Who can offer what Jesus Christ does? Life, freedom, the Love of God. He has the words of eternal life, and the disciples have come to know that he is the Messiah. His words are our words, his confession of faith is ours so that we too can have that same closeness to Jesus that the disciples did. We come so that we may hear the words of eternal life, the Good News of Jesus Christ, and so that we may be fed by Him, and fed with Him, with the Body and Blood of Christ, so that we can live forever because of Him. We can have a foretaste of the Heavenly banquet of the Kingdom, here and now, we can be fed with Jesus so that we can be transformed more and more into His likeness and prepared, here and now, for eternal life with God, and that we start living that life here and now, so that our faith is not a personal or a private matter but one which affects who and what we are, and how we live our lives, so that our faith affects who and what we are, and what we do, so that the Eucharist is our bread for the journey of faith, so that strengthened by Christ and with Christ, we may live lives which proclaim the Good News of the Kingdom. This is how are supposed to live together as a Christian community, living in love, fed with love itself, here in the Eucharist, where we thank God for His love of us. As children of God, loved by God, we are to imitate him, we are to live after the pattern of Christ, who offered himself, who was a sacrifice who has restored our relationship with God. It is this sacrifice, the sacrifice of Calvary, which has restored our relationship with God, which will be re-presented, made present here today, that we can touch and taste, that we can know how much God loves us; that we can be strengthened and given the hope of eternal life in Christ – that God’s grace can transform our human nature so that we come to share in the Divine Nature forever. Receiving letters: first loves, pen friends, when you’re far away – important, meaningful, something we’ve lost in a modern world with mass instant communication. It’s hard for us to imagine just how it felt to be a Christian in the Early Church – small isolated communities, persecuted, illegal, in desperate need of encouragement, prone to going astray. A situation with profound differences and similarities to ours, here and now. They need help – which starts with faith – what and whom they believe in – God the Father, the Creator of all, God the Son, Our Saviour Jesus Christ, and the Holy Spirit which sanctifies the people of God, the bond of love. They and we become partakers of the divine nature, how and what God is , not by the abolition of our human nature, but by its transformation, through the grace, the free gift of God. Grace perfects nature, it does not abolish it. Likewise when we talk of the Incarnation of the Son of God, we should be mindful of a phrase in the Athanasian Creed ‘not by the conversion of the Godhead into flesh but by the taking of the manhood into God’ The miracle of the incarnation is the means by which humanity can come to share in the very life of God, the fleshiness of God will lead to the Eucharist where God gives us his flesh and blood to eat and drink, so that our nature might be transformed. This is also what the Cross and the Resurrection achieve – a complete victory over this world, it makes it possible. So then what are we to do? We are to supplement our faith with virtue – in that human beings are creatures of habit, we become what we do often, hence the need to cultivate the practice of the moral virtues, the more that we do them the more they become not only what we do but what we are. It helps us to keep on keeping on with the Christian life , the life of faith, a process which began with our baptism, wherein we are regenerate, born again in the Spirit, freed from sin and its power, and our souls are infused with the theological virtues of faith, hope, and charity so that we be prepared for life forever with God.